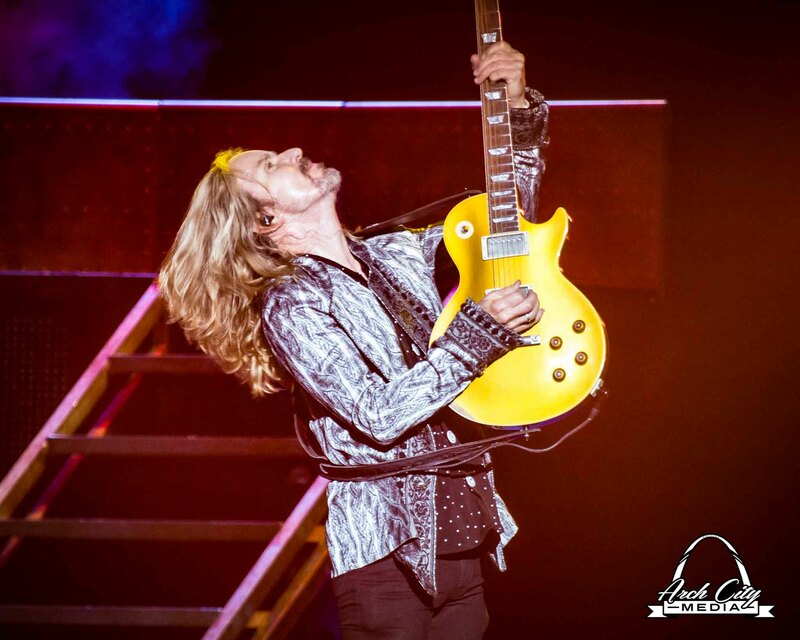 Styx brought rock to St. Louis last Sunday night at the Hollywood Casino Amphitheatre with the help of special guests, Joan Jett and the Blackhearts, and Tesla. It was a night full of classic hits, guitar riffs, and a type of energy that can only be felt in the presence of greatness. First to the stage was Tesla. Going on their 31st year as a band, Tesla doesn’t sound like they’ve missed a beat. Starting with 2008 release, “I Wanna Live,” the band immediately drew the crowd in. As lead singer, Jeff Keith, belted out hits like “Hang Tough” and “Heaven’s Trail,” the crowd continued to grow. Sounds of whistles and screams echoed through the arena as they played the first few notes of 1986 hit “Love Song.” By the end of the set the amphitheatre was packed and ready for what Joan Jett had in store. By the time Styx came to the stage the energy was through the roof. The set kicked off with a space themed countdown and imagery on the screens which played into the theme of their newest concept album, “The Mission.” Cheers erupted as the band played hits like “Blue Collar Man,” “The Grand Illusion,” and “Lady.” Their classic rock opera sound was as strong as ever, and as they asked everyone to put their lighters in the air for 1975 hit, “Light It Up,” it was apparent that their ability to entertain hadn’t gone anywhere either. Each song included its own personality and eclectic dance moves from keyboardist and vocalist, Lawrence Gowan, who joined the band in 1999. At one point in the evening Gowan slipped on a sparkling black jacket and top hat and truly seemed to feel the energy of the crowd as he performed “Rockin’ the Paradise.” Later, founder and bassist, Chuck Panozzo, joined the band for a rendition of “Fooling Yourself” that built the intensity in the amphitheatre to an all time high. After a keyboard cover of Queen’s “Bohemian Rhapsody” came the moment everyone had been anticipating. Styx began to sing “Come Sail Away” but was drowned out by the voices of the entire audience. It was a moment to remember, and it didn’t stop there. The band finished the night with an encore performance of “Mr. Roboto” and “Renegade,” ending with bursts of confetti and streamers raining down. It may be 46 years since Styx was founded, but they have proved that they are not done yet. So what’s next? Keeping the theatrics and bold harmonies in mind, maybe “Styx: the Musical” should be in the works.